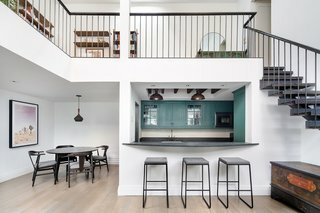 Step back in time in this historic Brooklyn residence that has 2,150 square feet of beautifully renovated living spaces, along with 21-foot-high ceilings. 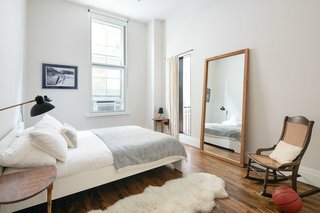 Serving as one of four units within a brownstone co-op, this thoughtfully remodeled home is located in the quaint, desirable neighborhood of Brooklyn Heights. 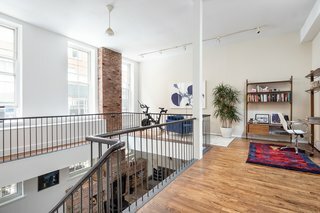 A rare find in the city, the property has the voluminous atmosphere of an industrial-style open loft, as well as the privacy of a freestanding home with a private, street-side entrance. 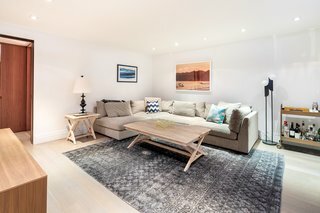 The home located at 56 Willow Street is a pet-friendly property, and has additional storage in the basement, as well as a part-time superintendent that looks after the co-op building. A closer look at the main living space. Upstairs is a 600-square-foot wraparound mezzanine. 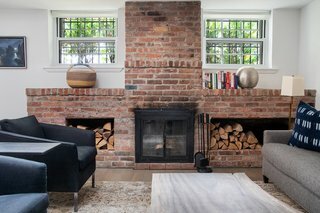 The brick on the wood-burning fireplace has been left exposed and offers a striking contrast to the surrounding white walls. Polished concrete, brilliant white architectural baseboards, stainless-steel sheathed doorways, and gray-stained oak flooring come together to create an impressive, and richly detailed home. A closer look at the warm and welcoming entrance foyer. To one side of the foyer is the main living area, which sits under the section of the house where the ceilings are the tallest. Within the home, the ceiling heights range from 11 to 21 feet. 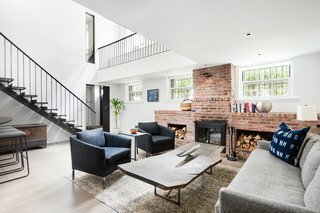 The main living space, also known as the great room, includes separate living and dining areas, along with a wood-burning brick fireplace that rises all the way to the top of the 21-foot, cathedral-height ceiling. 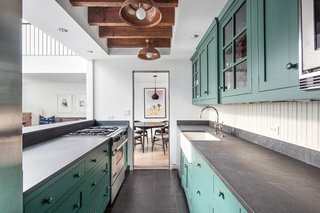 The kitchen features cheerful, sea-green cabinetry. Through the dining area is a doorway that leads into a spacious kitchen. This room features a farmhouse sink; custom shaker-style, sea-green cabinetry; a wainscot backsplash; a massive pantry; honed black-marble countertops; a breakfast bar; as well as multiple stylish appliances. Sculptural silhouette tells a tall tale with a midcentury twist. Space-saving design hits a dramatic peak and swivels with a 360-degree shade rotation, shining light any direction you need it. 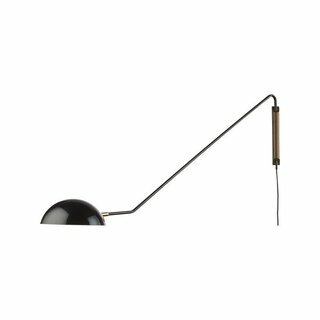 Glossy black steel illuminates industrial with contrasting brass interior that amplifies the glow. Ward Bennett based the design of his Landmark Chair on the shape of a classic English chair. 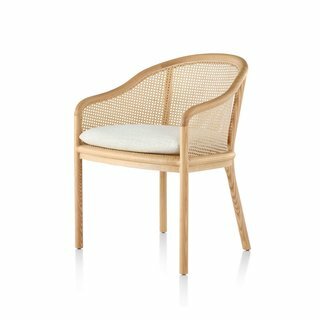 He then pared away what he deemed to be nonessential elements of the design to reveal the beauty inherent to the chair’s function: in a word, comfort. A look at one of the three bedrooms. 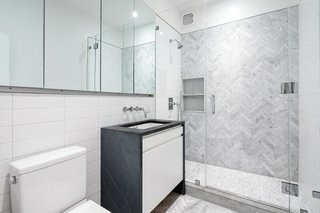 The first-floor bathroom is fitted with Carrara marble countertops, polished chrome Kohler fixtures, and a large Restoration Hardware vanity with cypress cabinetry. Nine windows have been installed along the south side of the apartment. Five of these windows are more than eight feet tall, and draw in plenty of natural light throughout the day. The third bedroom is presently used as a family room. 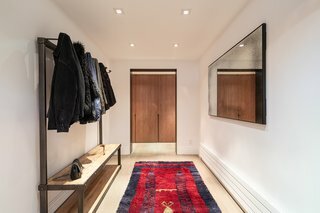 On the other side of the foyer is a third bedroom with a wall of closets clad in floor-to-ceiling walnut doors. Presently being used as a family room, this area also has a bathroom with a shower/tub combo. The wraparound mezzanine has a massive skylight. This space could be used for a variety of purposes, including being converted into a fourth bedroom. 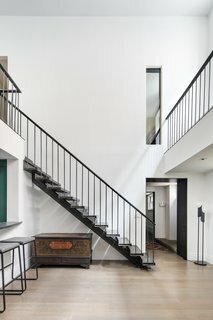 From the lower level, a custom-made staircase leads up to the second level that features two bedrooms, a bathroom, a sitting room, and a versatile space that can be used as a library, study, or home gym. A look at the master bedroom. The chic master bedroom on the upper level has a bay-window sitting area, as well as a full bathroom with a large, walk-in shower. 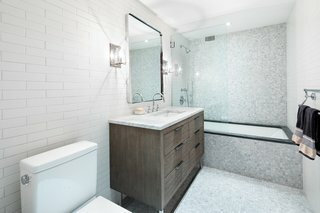 This room features Carrara marble, a custom vanity with Pietra Cardosa gray stone, and white lacquer cabinetry. The bathroom on the second level. 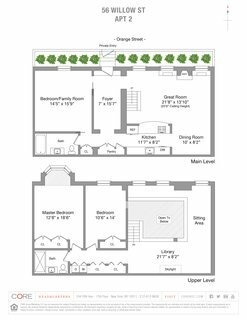 A look at the home's floor plan drawing. 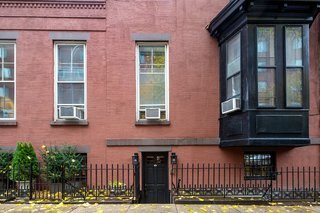 56 Willow St. 2, in Brooklyn, New York, is now being listed by CORE for $2,950,000. See the full listing here. Contact brokers Todd Lewin or Michael Rubin to find out more. 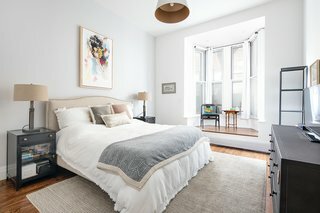 Know of a home for sale or rent that should be featured on Dwell.com? Here's how to get in touch.